Greater than 60 % of patients with end-stage renal disease initiate dialysis by a central venous catheter, and approximately 20 % of all dialysis patients are undergoing dialysis via a central venous catheter at any point in time. 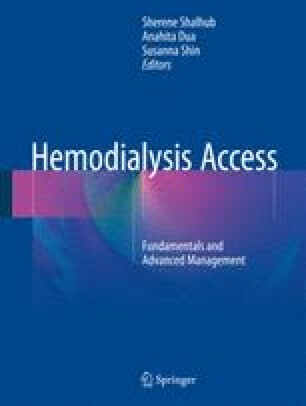 Given the widespread use of central venous catheters for dialysis access, this chapter will serve as a comprehensive overview of the topic, including a review of both tunneled and non-tunneled catheters, site selection, techniques for placement, and management of device-related complications. Chapter 3: Clinical Indicators and Preventive Care. 2014. Accessed June 19 2015 at http://www.usrds.or/2014/view/v2_03.aspx. Centers for Disease Control and Prevention (CDC) Dialysis Bloodstream Infection (BSI) prevention collaborative protocol. 2015. At: http://www.cdc.gov/dialysis/PDFs/collaborative/Protocol-Hub-Cleaning-FINAL-3-12.pdf.